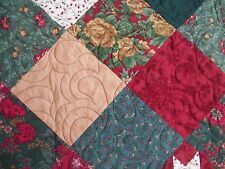 Gorgeous colors on this early quilt with deep red green and yellow. Lush quilting. Red swags and green triangles add to charm. Sleeve was added on back for hanging. Very well done. 1930's Snowball or Four point star Quilt Top. Quilt top : approx 55" x 80"(without trim). The quilt top is clean overall without strange odor. 1930's cotton fabric. Star block : approx 6 1/2" x 6 1/2". An exceptional quilt with an abundance of wreaths! Excellent condition and lightweight. Binding good condition. Hand sewn. Backing is white with one smudge as shown. Wreath design quilting. Quilt has white backround not yellow as shown in photos. A COLLECTORS TREASURE! PERFECT FOR YOUR COUNTRY BABY IS THIS WONDERFUL HAND APPLIQUÉD BUNNY QUILT. MUCH SOUGHT AFTER BUT HARDLY EVER SEEN. GREAT ACCESSORY FOR A NANNA'S HOUSE TOO! LOVELIEST COLOR WAY OF PINKS & YELLOWS. ~ 5" Squares ~. and three blocks are solid crazy quilt. There is so much you can do with these little squares! bordered by a crazy quilt pattern. Anything you make with these colorful squares will turn out beautifully! This top is loaded with sorts of fabrics with indigo blue, red, green, weaves and others. Estate find from Pennsylvania. Rare Antique "Tree Of Life" Quilt - Aged Condition. LOOK!! This auction is for a beautiful antique "Tree of Life" quilt from the late 1800's. It shows normal signs of use and has one small stain on one edge (see photos). This is a pretty rare quilt and is in nice condition considering it is going on 150 years old. This old quilt has a LOT of life left in it - don't mistake this quilt for a new one made just a few years ago. This is a genuine old antique. Because of the size and weight of this old quilt, we must ask that you help on postage by paying $10.00. 1945 dated Nine patch q uilt. Quilt : approx 64" x 98". There are light discoloration around the quilt. Nine patch block : approx 5" x 5". The quilt might need to be washed. There is No major dark spot in the front side. Terrific Old Feed Sack Cotton Fabrics - 1930's 1940's - See Pics. All Prints & NO Solids! Good Condition. No Holes No Tears, Small Blemish Or Two. No holes, very small stitches. Discovered in my great aunts estate in Brattleboro, VT. Her mother was the quilter and we believe this dates to about 1880-1900. The entire top is tight with no fraying or fabric wear. Wonderful estate of 63 BUTTERFUL CUT PIECES FOR QUILT MAKING! Clean with no holes or stains. What a fun group or I should say collection for historical study or research. They are feedsack era, but more of a quilting or dress fabric weight, not as heavy as feedsack. A very nice hand appliqued quilt top.It is a nice big one 92"x80",for a full size or queen.The pattern/design is dahilias,on a white ground.No holes, tears or stains. PATTERN, HANDMADE, COTTON QUILT, WITH MUSLIN FEEDSACK BACKING. BEAUTIFUL QUILT HOPEFULLY WILL BE USED FOR DISPLAY OR REPAIR. MILDEW STAINS, Needs TLC: Vintage Feed Sack FAN Quilt, Nice ARCS Hand Quilting ! The Red Work imagery is all in perfect condition. However, the blocks are outlined is a cross stitch using exceedingly delicate red threat and those threads have worn and various scattered places (see my 9th picture). Wonderfull Antique Hand Sewn Buttery Yellow Star Quilt Approximately 70” By 93”. Wonderful Vintage Quilt in great vintage condition has a few spots. Please look at all photos to help determine condition. Well made lovely quilt great for display or use. A flying geese quilt too in assorted fabrics and Lancaster Blue bars! Estate find from Pennsylvania. I hate describing a Quilt as a “cutter” but I had originally invisioned all sorts of projects I was going to make from this one which I never got to. It is a nice large size approx 83” by 88”. What a WONDERFUL treasure I have for you! Out of a lovely Pacific Northwest estate we have a LARGE and wonderful batch of quilt blocks. Twenty-Six (26) to be precise! Lots of beautiful colors and prints. ANTIQUE EARLY CALICO LOG CABIN QUILT TOP 70x76 LANCASTER, PA - CUTTER? 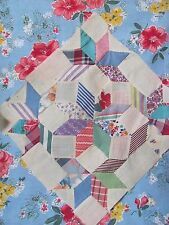 Antique Victorian late 1800's to Early 1900s Signed " A sunbonnet I had in NY" QUILT calico . All Cotton , ALL Hand stiched. Many are signed (embroidered) Irene, kasola, Mary, Mine? Bille And more. There are 168 blocks in this large very thinly batted and smooth (not clumpy) fantastic quilt. Amazing condition. Maybe never used. Really EXCELLENT condition! Size: 75" x 92" approximately. Block size: 6.5 x 6.5 Thanks for looking and please let me know if you need more photos or information. My best, Baby Bird Shipped with USPS First Class Package. The pattern might be a fancy variation of Rose Of Sharon, although we have not found this exact applique pattern so far. Its in good shape-no stains or discoloration-it does have a small cut in fabric on the edge in one spot. no odors from storage. As you see in the pics I have provided there are 72 blocks. You will receive 36 feed sack snowball centers along with 36 muslin centers. Enough to make a lap sized quilt. A ‘one of a kind’ scrappy effect of all different accuquilt cut feed sack and muslin pieces along with the corresponding cut triangles to connect to the ‘snowball’s’ four corners. Assorted prints with several browns! Estate find from Pennsylvania. 72" x 78". It was 100% hand sewn and very well made. It does have a few issues as you can see in the pictures. The four cornerstone edges are a little frayed at the edges, and there are several brown spots. Master Quilting! Master quilting! Fabrics in solid pink. Freshly hand laundered. Edges are turned and hand sewn. What a treasure!! This is such an interesting piece. Clearly has a LOT of age to it, a bleached muslin type background and three different black and white tiny OLD prints. It is eight-point star blocks and a sawtooth border. This was Grandma Judy's and I think she said she made this before she married. I had it hung on a large wall in a quilt hanger. I tried to show it as best I could. Antique 1930's 1940's Feedsack Dresden Plate Quilt Old Pinks Full 84 1/2 X 72"
A couple of seems need to be resewed: Nice and bright colors and Strong fabric: Shown on a full size bed. There are 23 full blocks and along the edge there at 7 partial blocks. All hand stitched. Fabric is very strong no weak spots in the fabric. 83 1/2" x 72". This quilt is well made with nice small stitches and thin batting. You can see this in the pictures. Overall this quilt would make a great piece to add to your antique or quilt collection. The fabrics are feed sacks; the piecing was done by hand (check pic # 8) as well as the beautiful, deep arc scalloped quilting; the batting is of course cotton, and it is thick. The backing is rough old cotton, off-white, almost creamy after many years. Charming Handmade Antique Irish Chain Quilt Yellow And White . Approximately 65” By 77”. Wonderful hand stitched quilt. Well loved showing some age and wear. Please look at all photos to help determine condition. Great for display or use. Shipped with USPS Priority Mail. Colors are very very brilliant, having beautiful and funky mid-20th century printed fabrics, minimal fading. It does not appear to have any repairs. Pre-owned used condition, typical age appropriate wear. First I am at a unsure what to call this, except a sampler. It has several patterns sewn together. Most is hand sewn but the larger block pieces have been machine sewn. It is very early indigo, red and calico material. This Geese in Flight quilt is exceptional, and I don't say that lightly: For one thing you rarely find anything made of this fabric on the market, its pretty yellow with red dots, that is made with white for this quilt. Beautiful Antique Carolina Lily Quilt. 72" x 77" Not certain of year made - appears to be quite old - approx. Well loved; no tears or wear. Hand laundered and line dried. Very Soft with lovely drape. A neat pattern to collect! Has age/other spotting tanning, fade line. Estate find from Pennsylvania. There are 19 different fabrics that make up the butterflies. BEAUTIFUL ANTIQUE VINTAGE BLUE AND WHITE QUILT 62" X 69"
62" X 69". IT HAS BEEN BEAUTIFULLY HAND STITCHED WITH TINY STITCHES. THERE IS A 7" REPAIR ON THE BACK WHERE THE FABRIC HAS SPLIT APART. ZOOM IN ON PHOTOS TO SEE CONDITION BETTER.